Semi-Automatic Device with Two Sets of Adult Pads, Battery, Carry Case, AED Rescue Kit, Owners' Manual, Training DVD and Quick Start Guide - SHIPS FREE! 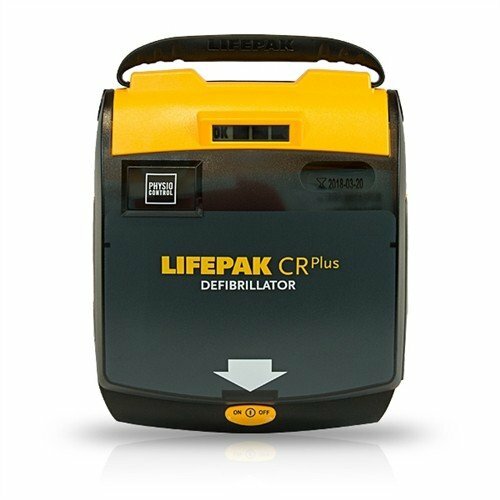 The LIFEPAK CR Plus AED Kit Semi-Automatic is capable of administering the highest level shock available in the industry. This powerful, semi-automatic AED can deliver a shock up to 360 joules. Delivering a shock at that level has shown to improve patient survival rates. The LIFEPAK AED is one of the most user-friendly AEDs on the market, designed to be easy for anyone to use, not just trained personnel. The rescuer simply turns on the device and follows the simple instructions delivered by ClearVoice. The user interface prompts the rescuer through voice instructions, audible tones, and graphics. Tests have proven that the LIFEPAK CR Plus will not compromise the safety of the rescuer. The LIFEPAK CR Plus has a variety of features that make the device easy to use and service. A readiness display shows the device status and the OK indictor displays when the last successful test was completed. There is also a CHARGE-PAK indicator is displayed when the battery charger needs to be replaced and a service indicator is visible when the device needs to be serviced. The LIFEPAK Plus AED Kit comes with an industry-leading warranty of eight years and is capable of transferring wireless data to a personal computer. You will rest easy knowing that you have access to this easy-to-use, life-saving device in the event of an emergency. Capacity: 30 full discharges or 210 minutes of "on time"